Who is this offer for? Build and sell apps – it’s as easy as that! As a partner of AppYourself you create apps with our platform but sell them directly to your customers under your own brand. We offer you a professional white label. With a well thought out permission system you can configure the platform exactly as you need it to reflect your business. Packages and prices are also customisable. We have extensive know-how when it comes to creating and selling apps and we are more than happy to share this knowledge with you as well as provide various sales and marketing materials. In recent years the way in which the internet is used has fundamentally changed. More people are now using smartphones to go online than PCs or laptops. Apps are playing a central role in this. Over 80% of all smartphone use takes place within an app. 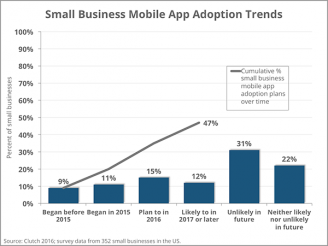 Small to medium sized businesses have a lot of catching up to do when it comes to reaching out to customers on their smartphones. 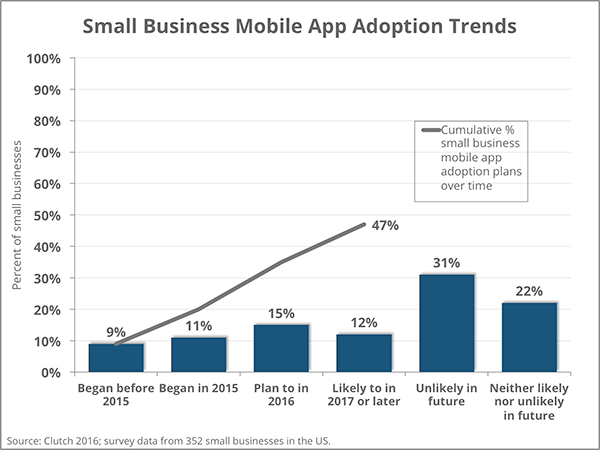 An American study has shown that this problem is known among SMBs and the majority are planning on buying an app in the coming years. Our app builder primarily serves the needs and demands of small to medium sized businesses. Our features make it possible for them to reach customers in an effective, innovative and modern way while connecting them to the business. With favourable buying prices you can have margins of 150% or more. A subscription model ensures that your revenue grows each month. Who is the Reseller Program suitable for? Our partners come from many different industries – from web design agencies to large internet and marketing agencies and publishing houses with many thousands of customers. We are currently working with a wide variety of companies and organisations. Want to broaden your portfolio with small investment and short set-up times? As a partner of AppYourself you can soon start offering your customers a solution to join the mobile revolution at an affordable price. Our app builder allows you to quickly and easily build apps for your customers. PR and media agencies who wish to offer their customers the possibility to promote and strengthen their business by entering the mobile world. Publishers who wish to expand their portfolio with websites and apps. Web designers who wish to create an app concept with AppYourself and add it into the marketing mix of their customers. IT and internet service providers who due to their technical competence can stand by their customers and offer them modern solutions. Familiarise yourself with our services, have a look at the various functions of the platform and read references from our partners. You can also test our app creator for free. If there is an overlap between your needs and what we offer, then we are perfect for each other! Use this contact form to request more information on the programme. We will contact you with all the details you need to know. If you have any questions before setting up a subscription, let us know by sending us your questions to reseller@appyourself.net, we are happy to help you make your decision. You have all the information, all questions have been answered and you have decided to join us as a partner? Smashing! You can set up a subscription clicking here. AppYourself will set up an account and send you the log in details within 1-2 business days. You will also receive materials to help you get started and contact details for any further support you might need.